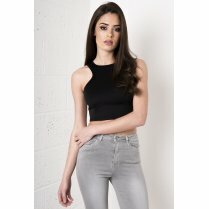 Keep it cool and casual this season with this simple cropped top. With long sleeves and a high neck, this versatile piece is a must have for every new season wardrobe. Team yours with ripped skinnies and chunky boots for an edgy easy-to-wear look.